Your body. Your definition. Now on Facebook. 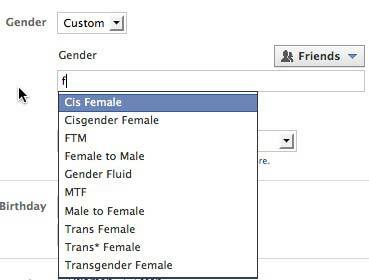 Facebook added the ability to set your gender outside the binary male/female choices just in time for Valentine’s Day. Now you can define yourself with a choice more reflective of who you really are if the binary choices don’t cover it. 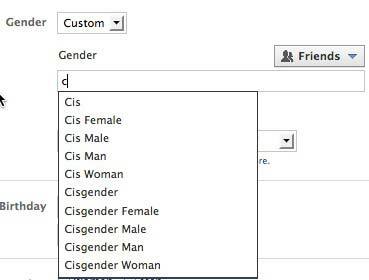 Here’s how to update your gender settings. 1. Choose Edit Profile. If you’re on the page with your News Feed, it’s under your name at the upper left. 2. Scroll down to the Basic Information Section and click Edit. I typed a “f” in the box. Here are the options offered. As you can see, choices included options with “f” in many places, not just as the first letter. 5. Pick a pronoun. If you choose a custom gender definition, you have a chance to choose your pronoun. The pronoun choices are limited and don’t offer some common choices that people who don’t fit the binary prefer. Maybe Facebook will add to the pronoun options later. They need to do that. Related post from 2010 (or this has been a long time coming) Have You Thought About the Gender Choices on Web Forms? This entry was posted in BlogHer, Facebook, SocialMedia, WebTeacherTips and tagged Facebook, gender, gender identity by vdebolt. Bookmark the permalink.